The Vitapan 3D-Master shade system provides a systematic arrangement of virtually all existing natural tooth shades and integrates them into one easy-to-use shade guide. Thereby inproving colour communication between dentist and dental technician. Colours can be clearly defined scientifically through a three dimensional model based on lightness, chroma and hue. On the left: Tooth shades are situated in this segment. This space encompasses all natural tooth colours. Until now tooth colours have lacked organized distribution in the tooth colour space, with either voids in colour coverage or heavy concentrations of several colours. 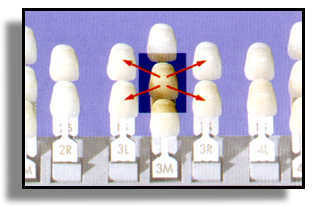 The Vitapan 3D-Master shade system has been devised so that the most frequently occuring natural tooth shadesare concentrated in the centre of the colour space. 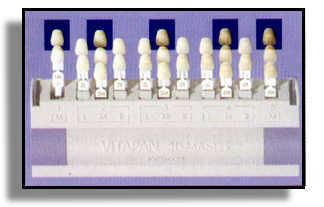 Vitapan 3D-Master thereby offers complete and systematic coverage of tooth colour, easy handling during colour selection by proceeding in systematic steps and provides a high degree of confidence with regard to colour determination colour communication and colour reproduction. 1. 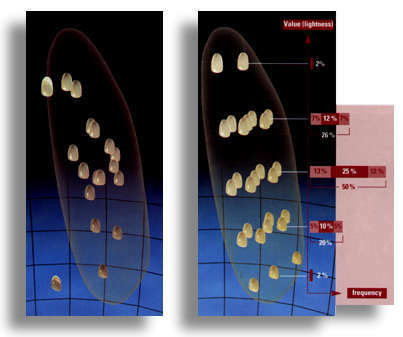 Select the value(lightness)from the five value groupswhich is closest to the tooth being compared. Pull out the medium shade sample (M) from this group. 2. 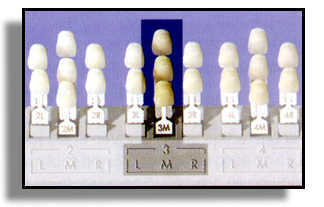 Select the shade sample of the M-group which is closest to the tooth being compared. 3. Check wether the natural tooth is more yellowish (L) or more reddish (R) than the shade sample of tke M-group selected in part 2. Select the best matching shade sample. All data is then entered on the easy-to-use Colour Communication Form. The plastic parts of the Vitapan 3D-Master Tooth\Colour guide consist of high-quality, temperature-resistant, easy-care material. The complete shade guide can be sterilised in the autoclave up to a maximum temperature of 140 degrees C (284 degrees F) and are also suitable for surface disinfection. 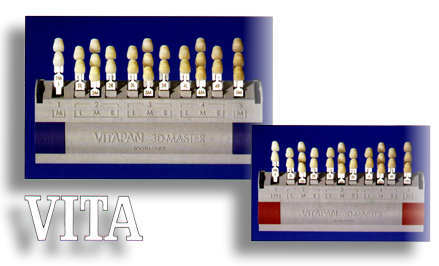 Note: Vitapan products are only available to qualified dental practitioners.